The Kaua'i Cave wolf spider is a member of the wolf spider family and also called the pe'e pe'e maka 'ole in Hawaii. Wolf spiders generally have a distinctive eye pattern, with two large eyes located within the middle row of eight eyes, but the Kauai cave wolf spider is unique to the wolf spider family, having no eyes at all and giving it its other common name, the "no-eyed, big-eyed wolf spider." The adult reaches up to 0.75 inches in length. It's carapace is reddish-brown, its abdomen is silver, and its legs are beige to pale orange. It has three large teeth for biting its prey which it catches not by catching it in a web like most spiders, but by chasing and grabbing it. 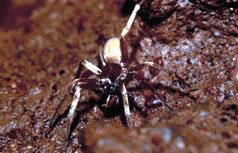 The Kaua'i Cave wolf spider's main prey is the endangered Kaua'i Cave amphipod. Little is known about its reproductive behavior. Females have been seen carrying the young in egg sacs in their mouths and 15 to 30 eggs may hatch per clutch. The newly hatched offpring are unusually large and the mother carries them on her back until they are old enough to leave and hunt for themselves. 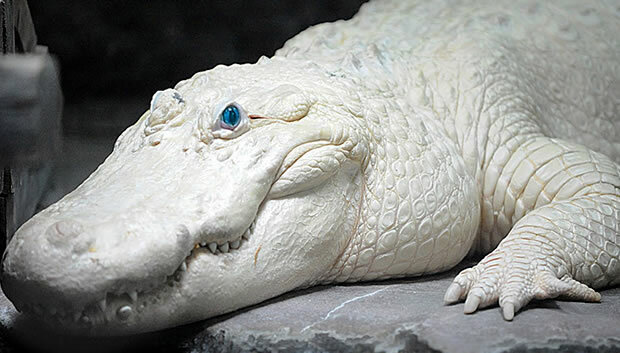 The main threat to the species is habitat loss and deterioration of its cave habitat caused by human activities associated with development and agriculture. They have also been threatened by the use of chemical and biological pest controls, which often are used for killing insects such as ants and cockroaches. A number of caves where the species can be found are now protected to ensure their survival, and the US Fish and Wildife Service has developed the "Kukui'ula Development Corporation" for restoring and protecting caves where the spider dwells. These caves provide habitat for the Kaua'i Cave wolf spider and other threatened species native to them. Glenn, C. R. 2006. "Earth's Endangered Creatures - Kauai Cave Wolf Spider Facts" (Online). Accessed 4/19/2019 at http://earthsendangered.com/profile.asp?sp=856&ID=7. Need more Kauai Cave Wolf Spider facts?